Heavy Duty Eddy Current Separator - Bunting Magnetics Co. 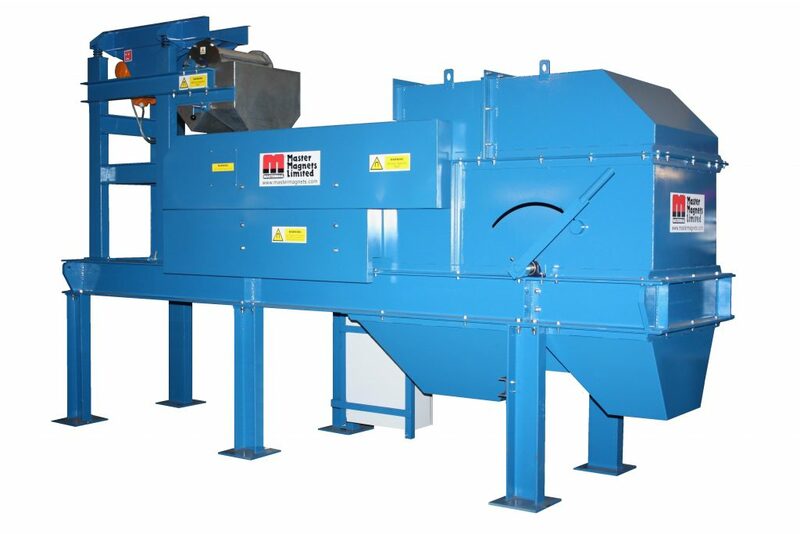 The Eddy Current Separator (ECS) is an advanced metal sorting unit that is capable of separating non-ferrous metals such as aluminium and copper from dry recyclables. Non-ferrous separators are very common in the fast growing market of beverage can sorting, where they can provide an accurate separation of aluminum cans from waste streams. Depending on the application, there are four rotor options available. An Eddy Current Separator consists of a short belt conveyor that has its drive located at the return end and a high speed magnetic rotor system installed at the discharge end. The magnetic rotor, which is positioned within a separately rotating non-metallic drum, revolves at around 3000 rpm during operation while the outer drum cover rotates at the speed of the Eddy Currents’ belt conveyor. As the rotor spins at these high speeds, an electric current is induced into conducting metals. The induced electric current produces a magnetic field, which opposes the field created by the rotor, repelling the conducting metals over a pre-positioned splitter plate. The remaining materials such as plastics, glass and other dry recyclables will simply free-fall over the rotor, separating them from the repelled metals. The High Intensity ECS units are specifically designed to handle the separation of small and difficult non-ferrous particles that require high repulsive forces for an accurate separation. This type of unit has a 11.8 inch diameter, 24 pole rotor and is available with operating widths of up to 6.5 feet. The Eccentric ECS units are intended to be used where the product size is below 0.4 inches. The eccentric ECS has a 7.5 inch diameter 12 pole rotor, which uses specially manufactured magnets to maximise the repulsive forces over the smaller diameter. The rotor is positioned inside the outer drum, towards the discharge point of the material flow, allowing the concentrated magnetic force to separate metals as they leave the belt conveyor. The ‘R’ Type fits into the ECS range between the Can Sorter and the High Intensity units, incorporating features of both machines. The ‘R Type’ can be manufactured up to 50 inches wide and is designed to be used in general recycling applications, where non-ferrous metals are over 0.8 inches. For more information on the ”R Type’ ECS, please click here. The Can Sorter is specifically designed for the separation of non-ferrous beverage cans from dry recyclables. Can Sorters are low-cost alternatives to larger Eddy Current units for customers that have simple can sorting applications, which will not require high specification machines. For more information on the Can Sorter, please click here. All of the ECS units are built standard with a vibratory feeder, chutes, covers and a base frame. Also supplied is a variable speed control panel, which allows the rotor and belt speeds to be tailored for specific separation processes. Other optional extras include: A high powered Rare Earth drum magnet can be utilized in applications with high ferrous content to remove small particles of ferrous, which may damage the rotor cover if caught underneath the belt; Rotary or static belt cleaning brushes for use in applications where the product may be wet or sticky. Receive our emails By signing up, you will receive information about our latest products and industry news. © 2017 Bunting® Magnetics Co.